It’s evident when watching Grier play that you’re watching someone with tremendous arm talent. Capable of making even the most difficult of throws off his back foot look completely effortless. His pocket escapability is second to none; making even the most routine sack attempts look nearly impossible. He keeps his eyes downfield when scrambling behind the LOS but when it’s time to tuck it and run he’s willing to sacrifice his body for the first down which is the kind of effort you want in a player, but for the more conservative approach he began sliding more about halfway through the season. A mature player that has already been through the more difficult parts of his career personal life-wise and knows how to handle himself both on and off the field. Although Grier has great arm strength, his deep ball can be inconsistent at times; such as the Virginia Tech game where he completed just 4 of 17 attempts where the ball traveled 20 or more yards downfield. Grier also has that gunslinger mentality that is entertaining to watch but can get players into trouble turnover-wise. Although he improves his sliding as the season goes on, he does end his season against Texas when he dives for the endzone and breaks the middle finger on his throwing hand. Grier is going to be 24 at the time of the Draft so he’ll be on the older end of prospects, which could slightly hurt his draft stock. 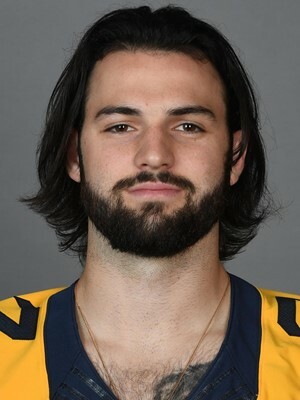 An immensely talented passer with the ability to escape the pocket as good as anyone; I see the potential for Grier to step in and start immediately in the NFL. Although he struggles slightly with turnovers sometimes (4 of his 12 INTs came in one game against Oklahoma State), if he tones down the turnovers a little bit more and can find a little more of a consistent touch on the deep ball he can work into the top 15 conversation. He’s a little older than most of the other prospects that will be at the Draft which won’t hurt him too much, given that he’s one of the more mature prospects. Rushing: 9 carries, 58 yards, 0 TD, 0 FUM. Rushing: 3 carries, 11 yards, 0 TD, 0 FUM. Rushing: 4 carries, 27 yards, 0 TD, 0 FUM. Rushing: 9 carries, 52 yards, 2 TD, 1 FUM. Rushing: 6 carries, 29 yards, 0 TD, 0 FUM. Rushing: 3 carries, 4 yards, 0 TD, 0 FUM. Rushing: 2 carries, 10 yards, 0 TD, 0 FUM. Rushing: 3 carries, 6 yards, 0 TD, 1 FUM. Rushing: 5 carries, 29 yards, 0 TD, 0 FUM. Rushing: 2 carries, 2 yards, 0 TD, 0 FUM. Rushing: 1 carries, 1 yards, 0 TD, 1 FUM. Rushing: 3 carries, 2 yards, 0 TD, 0 FUM. Rushing: 0 carries, 0 yards, 0 TD, 0 FUM. Rushing: 1 carries, 6 yards, 0 TD, 0 FUM.